Hampi in Karnataka’s Bellary district, is a UNESCO World Heritage Site. It was the capital of the erstwhile Vijayanagar Dynasty which later got demolished by the Mughal invaders. 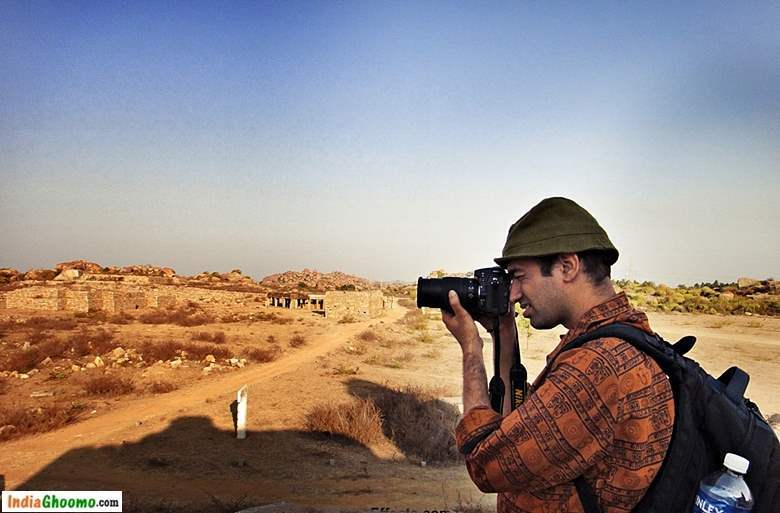 Arid Landscape & Rich History – The surreal boulder laden landscape of Hampi dotted with patches of coconut and paddy fields attracts tourist from around the world. 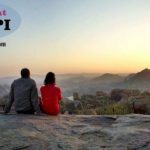 Hampi is an amazing place to spend a couple of days wandering around admiring its arid landscape and discovering the rich and vibrant history and culture. Located on the banks of river Tungabhadra, The Sacred Centre in Hampi is where most of the temple and religiously significant sites are located. 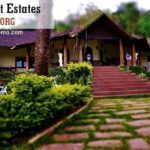 For the sake of convenience, We have categorized Hampi Sacred Centre in 4 groups based on its proximity and each requires about 2 hours to explore. 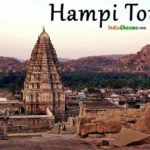 From Hospet hire an auto-rickshaw or catch the local bus and in about 30 minutes you would be at the centre of Hampi – Kamlapur. 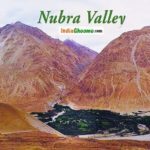 How to Reach Group 1 Sites ? Hampi not just has historical relevance but also mythological ones. 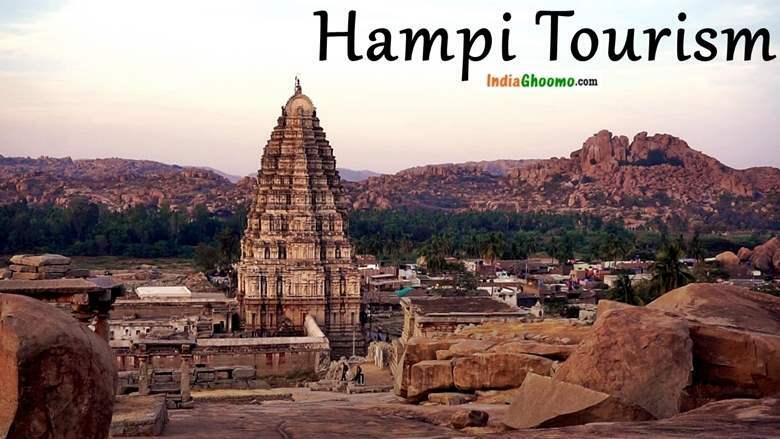 Hampi was the same place that is referred as Kishkinda in epic Ramayana. Kishkindha Kand in Ram charit Manas is believed to have taken place in Hampi. 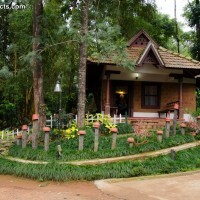 The Malyavantha hill and Raghunath Temple is 3 kms down the road from Kamalapur. 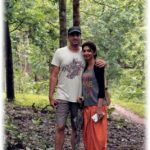 The road ends at the foothills and you will come across a huge boulder right in front of the Entrance Gopuram, the boulder almost covering the entrance. You can park your vehicle there and on the left you will see the entrance to the Raghunath temple complex also called the Malyavanta Raghunath Temple. The temple complex is pretty huge with the main shrine at the centre of the complex. At the entrance of the main shrine, you will find a number of pujaris chanting chaupais from shri Ramcharitmanas 24X7 since past 8 years. 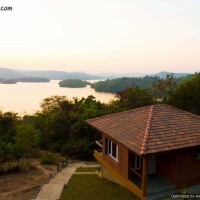 This surely has made the ambiance very peaceful and one can feel the positive energy around. 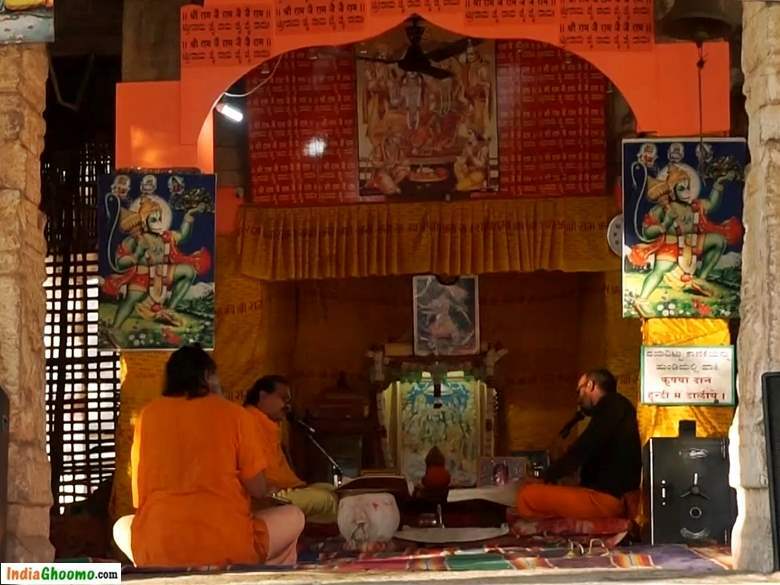 The Malyavanta Raghunath temple is very significant from a religious and mythological point and is dedicated to Shri Ram also called Raghunatha. According to Ramayan, Shri Ram & Lakshman stayed here until monsoons were over and then marched towards Lanka along with Sugrivs Vanar Sena. The deities in the temple are Shri Ram, Mata Sita, Lakshman & Shri Hanuman ji carved out of a single massive boulder. 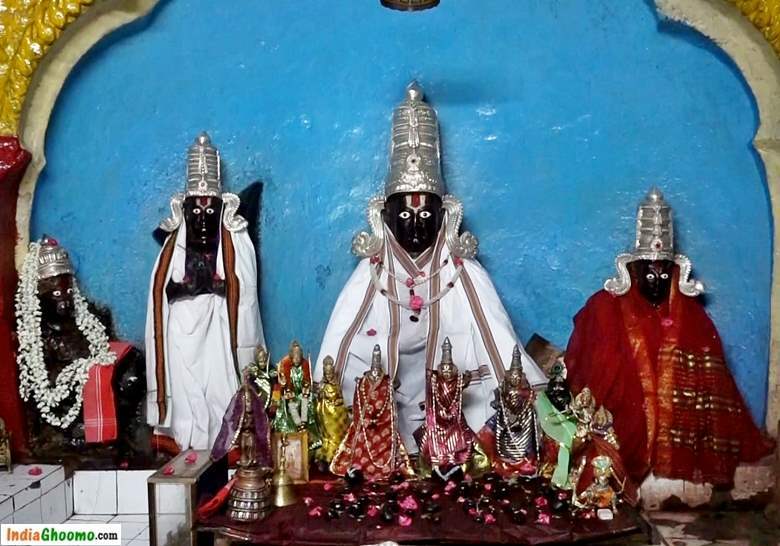 Shri Rama and Lakshman in sitting posture, Mata Sita in the form of Maa Lakshmi standing next to them, and Shri Hanuman ji in a kneeling posture. The massive temple complex is built around this boulder. The deities are below the protruding boulder above which the tower of the temple is constructed. The backside of the temple complex towards the left leads to an old well and a little further down you will come across Natural splitting of a rock into two large stone slabs separated by a gap in between which always has some water. Both the slabs bear row carvings of Shivlings and nandi lined parallel to each other. Just about 100 m ahead on the rocky path is a great site to get a panoramic view of the valley, boulders and other monuments. A short hike from inside the temple complex towards the right leads you to the top of Malyavanta hill. 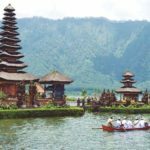 It’s a great place to watch the sunrise and the best part is you won’t find too much of tourist crowd. 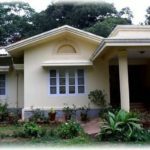 The hill top offers a 360 degree panoramic view of the surrounding mountains, monuments and patches of paddy fields and coconut and banana plantations. We have already published Sunrise at Malyavanth hill post/video.You can watch the video/post here. 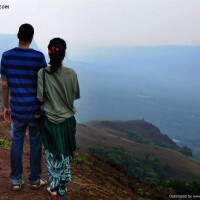 So that was about the Malvyavanth hill & Raghunath temple. Now, comes the Badavi Linga & Ugra Narsimha both situated next to each other not very far from the malyantha hill. Badavilinga Temple is dedicated to Lord Shiva worshipped in the form of Shivling. 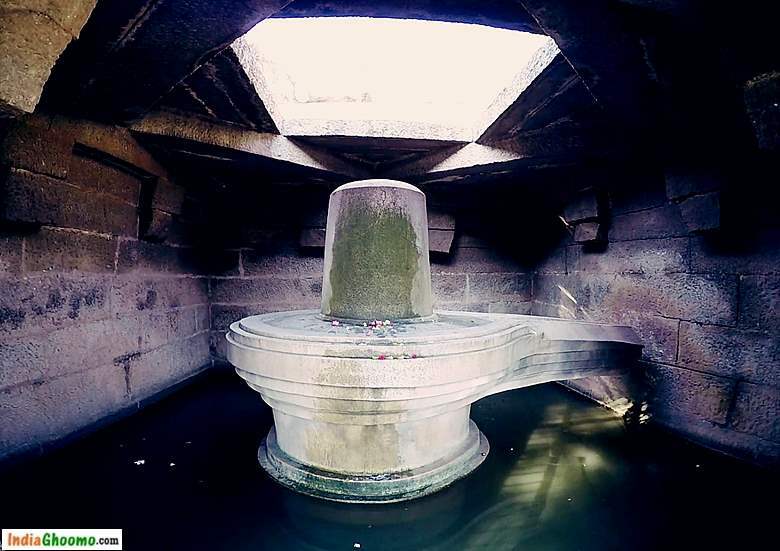 This largest monolithic Shivling in Hampi is made of black stone and has a height of 3 meters. The temple has been in existence since the period of the Vijayanagara Empire. The Shivling bears a tripund mark drawn in line carving. The sanctum in which the Shivling is installed is always filled with water due to a water channel installed inside. 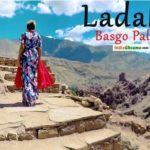 The name Badavilinga is a combination of two words – Badva (meaning poor) and Ling (represents Shiv). Legend has it that the Shivling placed inside the temple was commissioned by a poverty-stricken peasant woman. Hence the temple came to be known as Badavi Linga Temple. The Shivling is situated inside a small chamber with a single opening in front for the devotees to get inside. 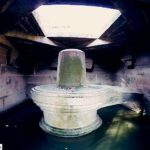 The stone chamber has no ceiling thus allowing the sunlight flood over the Shivling . Despite of some minor damage to the temple caused due to the reign, the Shivling at Badavi Linga temple stands intact even today. 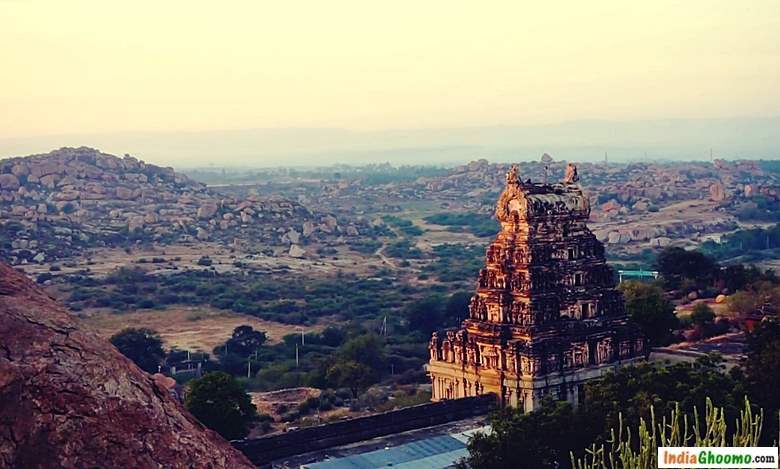 On the left o the Badavi Linga temple is a huge monolithic figure of Lord Narsimha also called as Lakshmi Narsimha and it’s also the largest statue in Hampi. 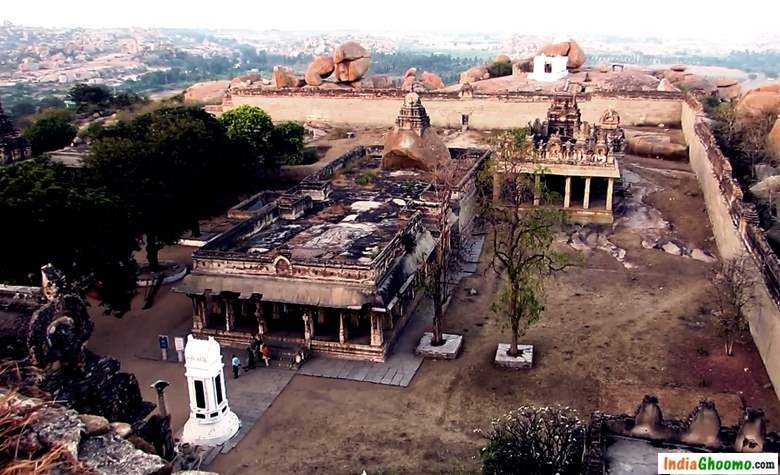 It was constructed during the rule of one of the greatest rulers of the Vijayanagar empire – King Krishnadevaraya. 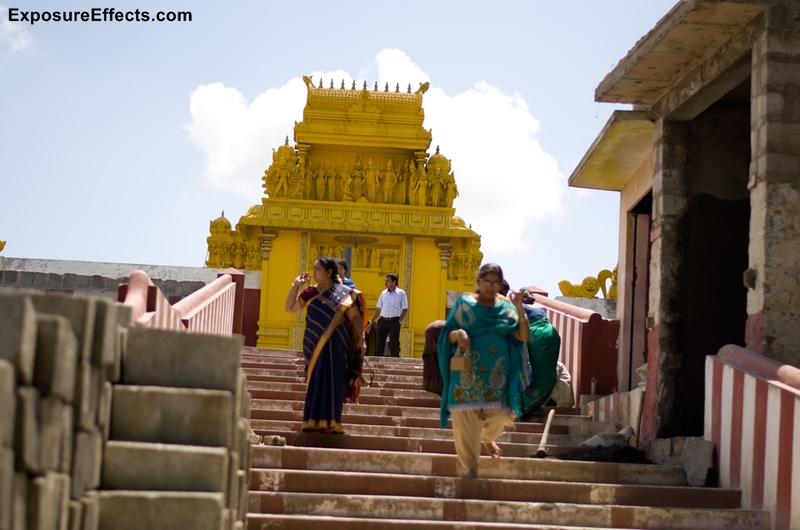 The temple is dedicated to Lord Narasimha, one of the ten avatars of Lord Vishnu, and Goddess Lakshmi. Narsimha means half man half lion – and is one of the 10 incarnations of lord Vishnu. 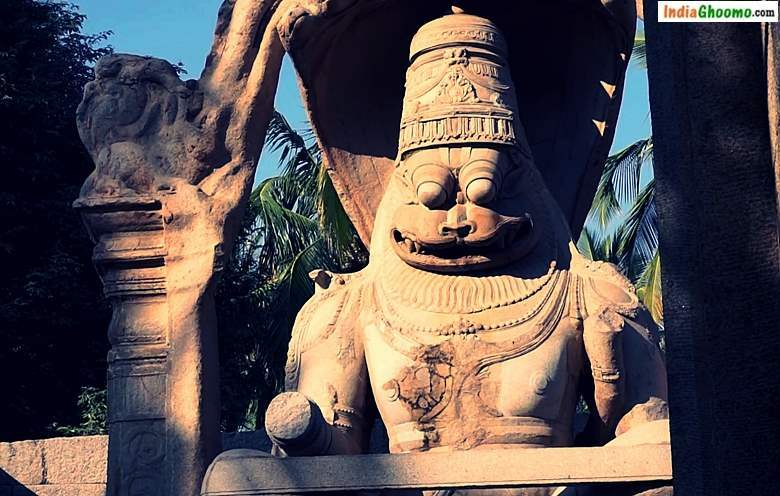 Also referred as ugra Narsimha – the terrifying form due to the depiction of protruding eyes and facial expressions. Four armed Lord Narsimha sits in a crossed-legged position with a large 7 hooded naga curling above his head acting as the hood. 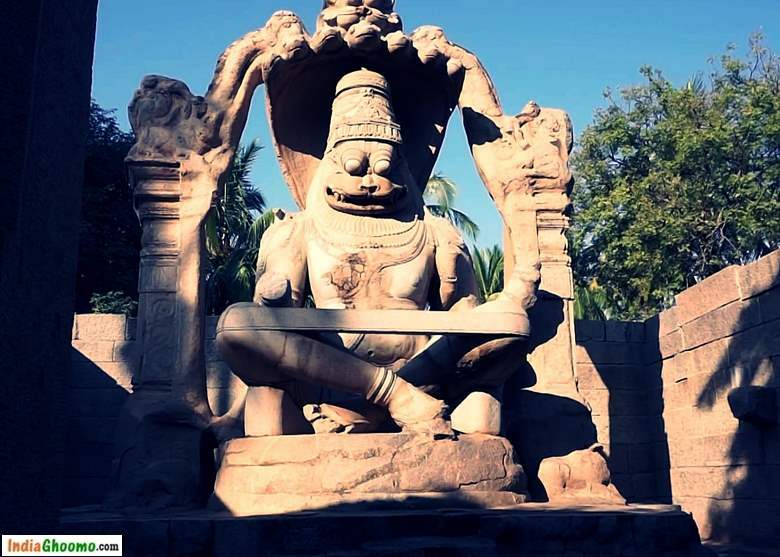 The original sculpture also had a small figure of Goddess Lakshmi, consort of Narasimha, sitting on his left lap. The marvelous statue was destroyed and mutilated during the raid by the Mughals which eventually led to the fall of the glorious Vijayanagara Empire. 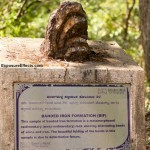 All the limbs of Narasimha statue were broken during the attack. The figure of Maa Lakshmi was separated from that of Narasimha. Today, the damaged statue of goddess resides at the Archaeological Museum at Kamalapura. So that was about the Badaviling and Ugra Narsimha. These temple are again very close to each other. Unfortunately we couldn’t cover the attracting during our this visit. 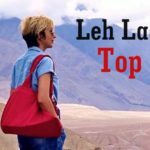 We will cover them in our next trip to Hampi and make a separate video and leave a link to the video in the description box. Monopods and tripods are not allowed at most of the sites. So, that complete The Group 1 of the Sacred Centre. 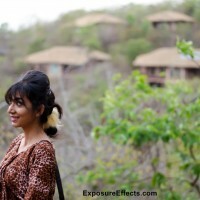 Stay tuned for our next Hampi post/ video in which we will cover the Group 2. Hope you enjoyed watching and reading this post/video and found it useful. 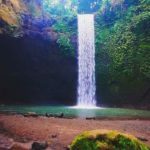 SUBSCRIBE our channel India Ghoomo to get notified of our future travel video uploads. Thanks for Watching.